The bold jumper (Phidippus audax) is a common jumping spider distributed throughout North America, and because it travels well, it has hitchhiked to many other locations, including Hawaii and the Nicobar Islands (in the eastern Indian ocean). 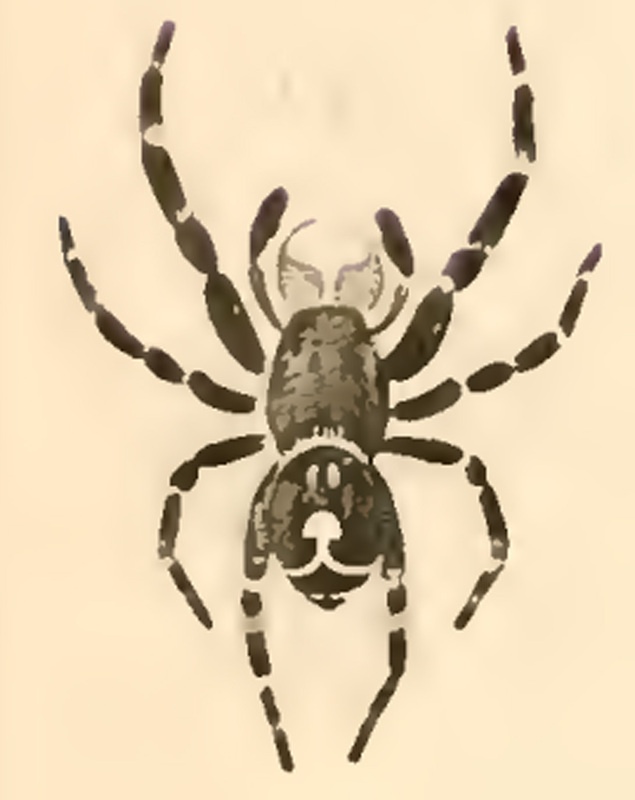 The species was first described in 1845 by the French-American arachnologist Nicholas Marcellus Hentz (1797-1856). 1. Attus audax. PL 7, figs. 6, 7. Description. Black ; abdomen with a spot, several dots and lines, white ; cheliceres brassy green ; feet with gray and white hairs, 1. 4. 2. 3. Observations. There is some obscurity in regard to the distinction between this and A. 3-punctatus, but there can be little doubt that there are two different species. The generic name Attus (Walckenaer 1805) has fallen into disuse; though it was used as late as 1903 by Bösenberg, since that date all the species previously listed in that genus have been transferred to other genera. 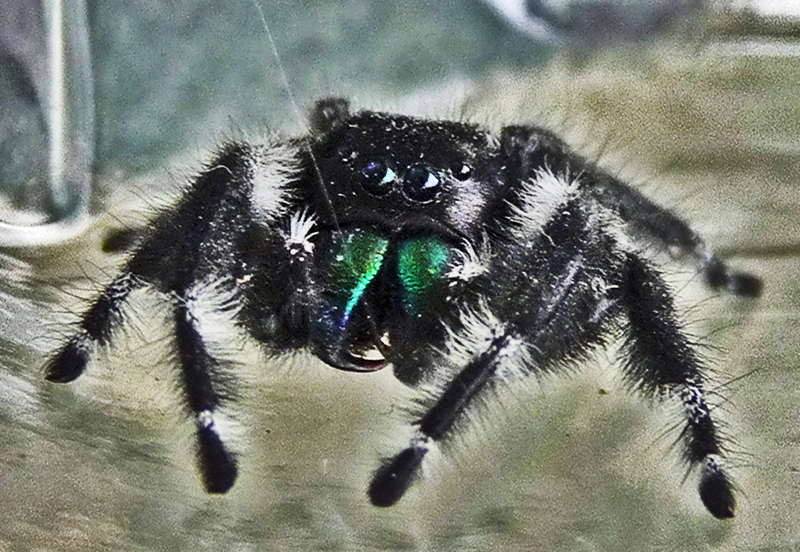 The bold jumper is now considered to be in the genus Phidippus (described by C.L. Koch 1846). I am attaching five pictures — Note that the photographs posted on this page, as with all the photos posted on bugsinthenews.info, can be enlarged for more detailed viewing by placing your cursor over them and left-clicking — so you can use whichever ones you like. I think I got some pretty good ones for being able to see the markings. The last picture — which is not shown, as the spider is out of focus in that photo — is for fun of him being set free in my tomato garden. He ran along the hose and when he encountered a potato bug, he ran away even as the potato bug was following him! Is he not a meat eater — no, all spiders are carnivorous (meat eaters) — or is that just not a good source — it was probably a bit too large for a jumping spider to deal with (they tend to skip prey that is more than twice their size) —for him? I remembered Joy very well. 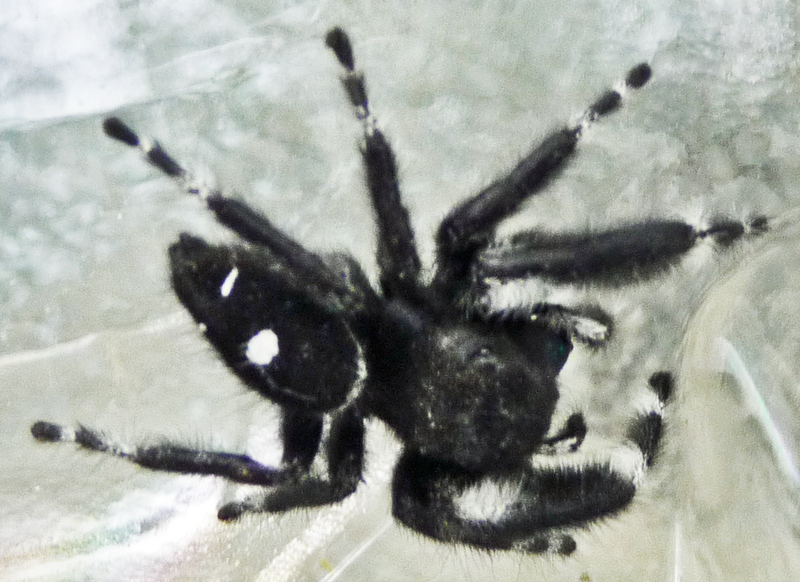 Her photos of a wafer trapdoor spider were posted in March 2010. Later on, after sending the photos posted here, she sent in a set of photos of a yellow garden spider (Argiope aurantia), that included several excellent shots of the male of that species. We don’t often get photos of the male Argiope aurantia because, ordinarily, he dies at the climax of the mating ritual. But a female yellow garden spider in Joy’s yard played hostess to what appeared to be an unmated male on her web for some time, and Joy captured it on film. The spider posted here is a member of the Salticidae family, known as the jumping spiders. Salticids comprise over 500 genera (63 native to North America) and over 5,000 species (315 in North America). The genus Phidippus, to which Joy’s specimen belongs, contains 60 species, 47 native to North America. 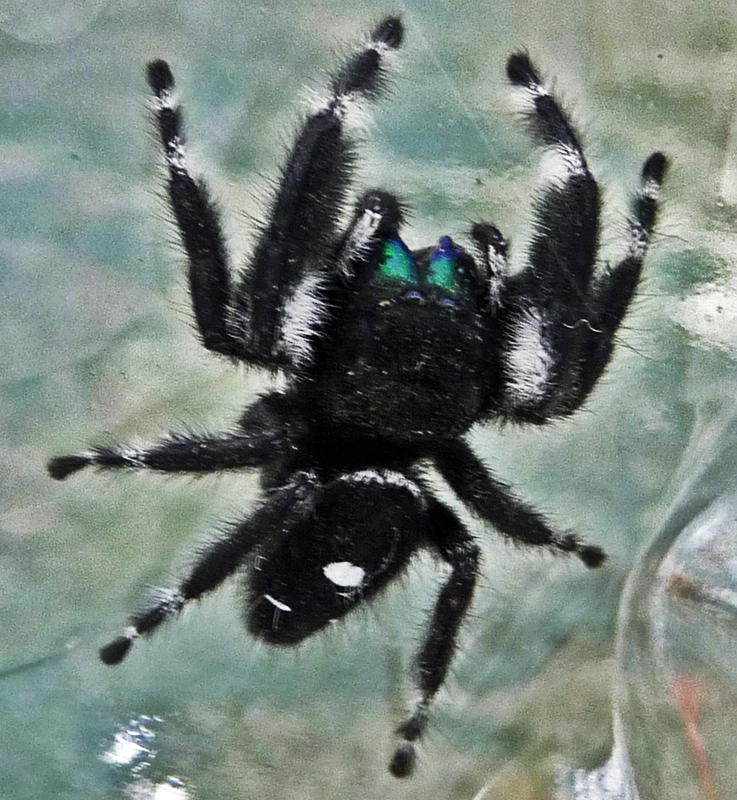 This particular species, known as the bold jumper, with the binomial taxonomic designation Phidippus audax, is one of the largest of our jumpers. Thus, this spider is apt to behave boldly, even audaciously. And it does, though with such finesse and seeming playfulness that most humans who are entertained by one of these creatures very long soon lose their fear and come to respect and appreciate them, just as Joy did. Now, a tiny word of caution: if you click on the first photo on this page, it will enlarge on your computer screen so you can see it up close. When you do that, you will notice large fangs at the tip of each jaw. These pierce human skin rather easily, and this species is not afraid to bite if it is handled roughly. Fortunately, though the bite smarts for a time, the venom is not dangerous. This particular spider is a male. Most of the time, when a male spider is examined closely, the pedipalps are observed to be much enlarged at their extremities. 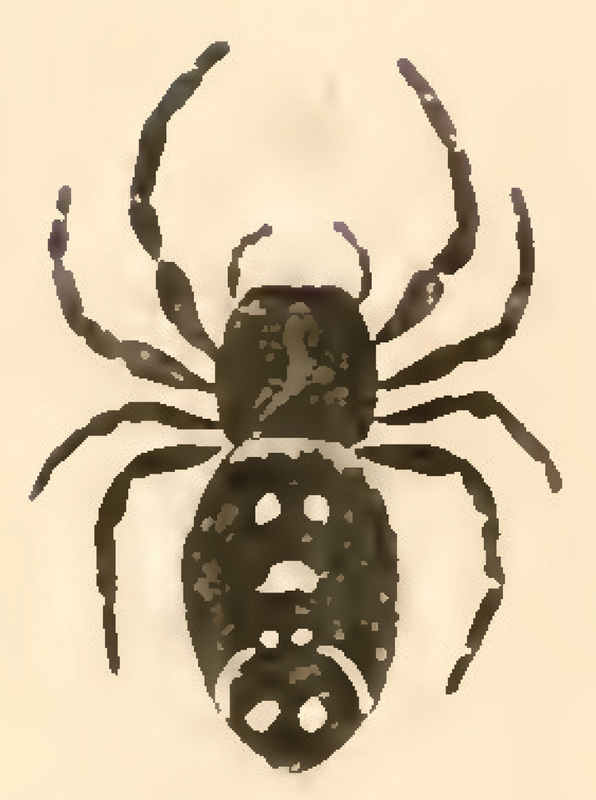 That is true, in fact, of many salticids, but the male bold jumper has pedipalps that are not much larger distally than those of the famale, though they are somewhat larger than would be expected of a female pedipalp (whose segments are smaller toward their tips, while those of the male have distal segments that are larger than the proximal and middle segments), as these photos show. The male has white rings on the legs that are absent on the legs of females. Females, on the other hand, have prominent tufts of hairs on the dorsal head, which are absent or much subdued on the male. BugsInTheNews is a VIEWER-PARTICIPANT WEBSITE. Questions? Corrections? Comments? BUG ME RIGHT NOW! Telephone Jerry directly at 512-331-1111, or e-mail jerry.cates@bugsinthenews.info. You may also register, log in, and leave a detailed comment in the space provided below. Do you know why Bold Jumping Spiders are in Hawaii or the Nicobar Islands? Also, are there any online resources you can recommend with a good phylogenetic tree for Jumping spiders?